Since 1995, hundreds of poor children in Muzaffarpur, India have mysteriously suffered seizures and feelings of brain fogginess, usually in the morning. Many would soon die. This happened every year between May and July: In 2014, for example, Muzaffarpur hospitals admitted 390 kids with the symptoms, resulting in 122 deaths. No one knew what was causing the acute brain disease—but the suspicious timing of the outbreaks implied it might have something to do with the lychee fruit, since Muzaffarpur is a popular lychee-growing region. Was it bacteria? Pesticides? Toxic metals? An international team of scientists reviewed both the literature and the 2014 outbreak, and found that chemicals in the lychee fruits themselves probably caused the illness—most frequently, in kids who had forgone dinner the night before. 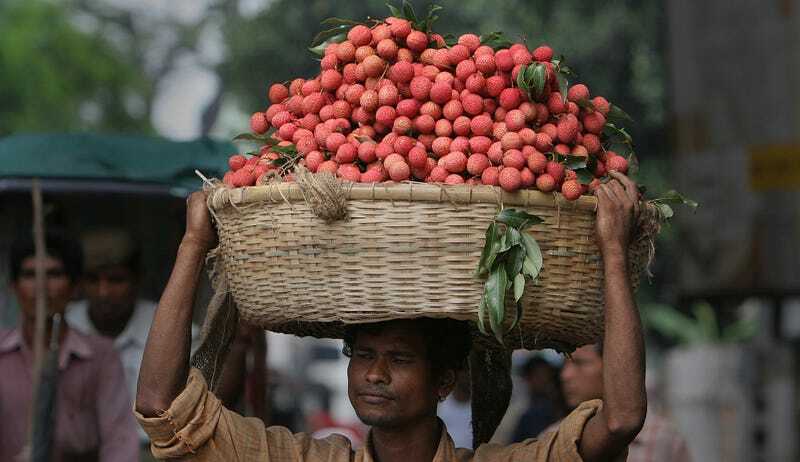 The results, published in the journal The Lancet Global Health, are the largest investigation to date of the Muzaffarpur mystery, and they present strong evidence that lychee caused the outbreak. The investigation started in 2013, when researchers compiled as many studies as they could on the Muzaffarpur illness. All of the case studies involved children, ranging from 6 months to 14 years of age. The researchers saw patterns, including low levels of the blood sugar glucose in many of the stricken children. A search later in 2013 revealed that the lychee contained a chemical called MCPG (methylenecyclopropylglycine), which caused similar levels of low blood sugar in animals. Finally, the scientists found cases of a chemical called hypoglycin A that caused neurological symptoms in people who ate another fruit related to the lychee, the ackee fruit. The dots were beginning to connect, but no study had yet linked lychee consumption to brain disease. So, the researchers camped out in Muzaffarpur hospitals, tested lots of the children that entered with the telltale symptoms, and asked the parents about their children’s lifestyle and eating habits. They also collected lychees from the orchards near the highest concentration of cases. It turns out that compared with kids who didn’t suffer symptoms, the odds were 9.6 times greater that a stricken kid had eaten lychees, 6.0 times greater that the kid had visited a lychee orchard, and 2.2 times greater that the kid had missed dinner the night before. The sick kids were also more likely to have eaten unripe or rotten lychees. Things were all coming together. Around half the 73 urine samples collected from the kids in hospitals showed up positive for MCPG and hypoglycin A—and so did all of the lychees collected, with higher concentrations in unripe lychees. “This is the first confirmation that this recurring outbreak in Muzaffarpur is associated with litchi consumption and both hypoglycin A and MCPG toxicity,” wrote the researchers. But other researchers believe that the study definitely ties the disease to the lychee, according to a commentary written by Peter Spencer and Valerie Palmer from Oregon Health and Science University. The outbreak in India, and seemingly similar cases in Vietnam and Bangladesh, amount to a sort of perfect storm of malnourishment and a booming lychee industry. “Fortunately, the high cost of these imported fruits and the likelihood that [they] would be eaten in small quantities by well-nourished consumers, suggests there is little reason for concern in the USA,” the authors write. Officials have now recommended children in the area around Muzaffarpur limit their consumption of lychees and always eat an evening meal—and these recommendations seem to be working. Now, there are less than 50 cases reported per year, according to The New York Times. However, Spencer and Palmer worried that similar cases may pop up in other places with lots of lychees and malnourished children. They hope the industry and lawmakers work to develop guidance for those planning to eat lychees. As for you, reader: don’t eat too many lychees on an empty stomach.